How to Roast Any Vegetable – When prepared well, roasted vegetables can be serious comfort food – and they can be used well beyond the satisfying side dish that they naturally are. This convenient guide offers cooking times, temperatures, helpful hints and lots of delicious ideas to make the most of inexpensive, healthy, versatile veggies! 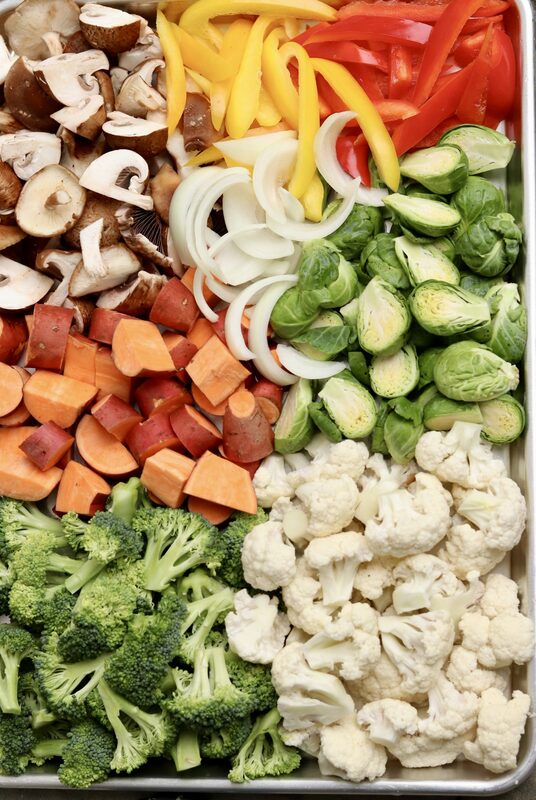 It’s a question I receive often, and there’s a short list of answers that may help: cut the vegetables into similarly sized pieces, spread them in an even layer on the baking sheet, and make sure the oven temperature is high enough. There are additional considerations, however, that when accounted for, have the potential to elevate every vegetable suitable for roasting, from a tender spear of asparagus to a hefty winter squash. I’ll never forget when my older son first tried Brussels sprouts as a toddler. I was certain he’d reject them as I did at that age. Instead, he uttered an enthusiastic “Yum!” and asked for more of the simply roasted gems. Roasting vegetables concentrates their natural flavor and sweetness while adding an element of crispness. So my son’s first Brussels sprouts were a far cry from the mushy, steamed iteration that was the norm when I was young. 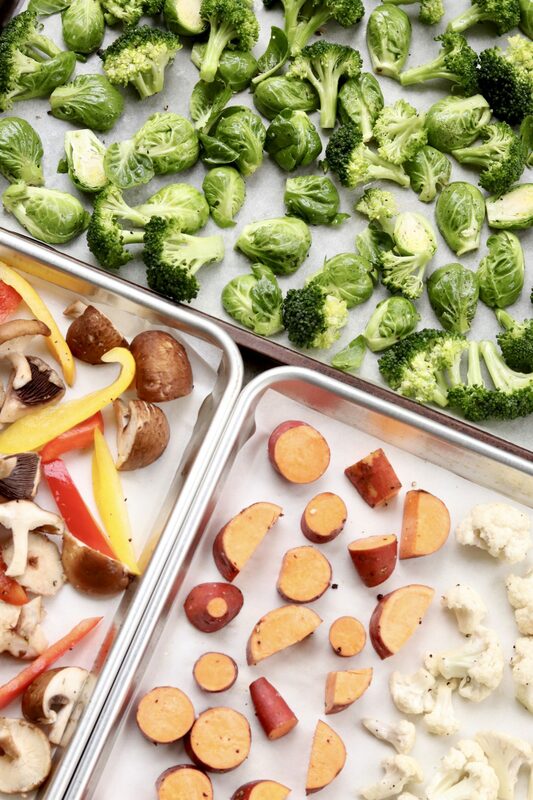 With that memory in mind, when I taught a class on “eating your vegetables” to a group of high school students recently, we roasted a variety of vegetables so the students could compare the flavors to that of the raw or steamed version. As the months turn cooler and summer’s bounty of produce dwindles, I often take some time on a Sunday afternoon to roast a variety of vegetables for use throughout the week ahead. I always appreciate that small effort later in the week, and I find we eat more produce as a result. Instead of a recipe, per se, the following is designed to be a comprehensive guide for successfully roasting a variety of vegetables. I’ve addressed many of the questions I’ve received over time and included a variety of helpful hints regarding parchment paper, cooking oils, baking sheets and how to get that desired golden brown crust. Many readers report trying to eat more plant-based foods, so I’ve also included complementary pairings and ways to bolster the roasted vegetables into a satisfying meal. I also tend to be overly optimistic when buying produce for the week, so I often take to roasting the leftover odds and ends in order to quickly transform them while they’re still fresh. Once the assorted veggies have been magically transformed through the high heat of the oven, they never seem to go to waste. 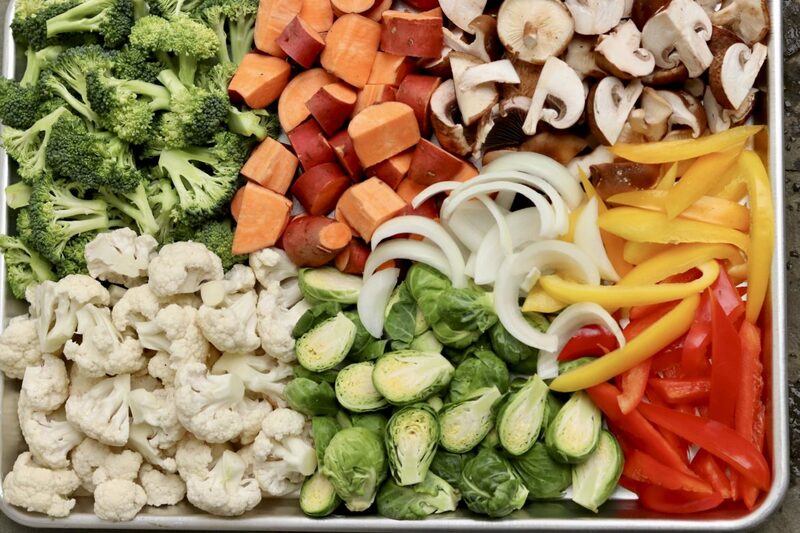 Aim for 1-2 tablespoons of oil per pound of chopped vegetables. (This will be roughly 4 cups of chopped veggies but will vary somewhat.) You want enough oil to lightly coat the pieces but not so much that they are dripping. You can toss the vegetables in a bowl or right on the tray – although with the latter method, I always end up spilling some overboard. For less mess and fewer dishes to wash, I keep a few clean plastic produce bags on hand because they work as well as a zip-top bag for tossing the vegetables with the oil and seasonings. As for seasoning, I give the cut vegetables a generous sprinkle of salt and pepper after they’ve been tossed with the oil and then toss again. This is largely a “to taste” or personal preference thing, although well-seasoned vegetables tend to have more appeal. To achieve a variety of flavor profiles, extras like cumin, chili powder, smoked paprika, Italian seasoning, or curry can be added to taste. A hint of brown sugar or maple syrup for sweet vegetables like sweet potatoes, carrots and winter squash is another good option, as is a tablespoon or two of soy sauce, balsamic vinegar or lemon juice. A sprinkle of Parmesan in the final minutes of cooking is yet another tasty option. Although excellent results come from roasting directly on the baking sheet, parchment paper and aluminum foil make for easy cleanup. Parchment paper is naturally stick-free while foil should be oiled to prevent sticking. Even so, some vegetables stick more than others. For example, I never grease the baking sheet when roasting asparagus but grease it liberally when cooking potatoes. To be safe, grease (or spray) when in doubt. Note that most parchment papers are rated for temperatures no higher than 420°F to 450°F.Paper with a lower rating will tend to darken and turn brittle but is unlikely to burn at higher than recommended temperatures. However, the paper can burn if you turn your oven to broil. (I speak from experience!) If you plan to switch to the broil setting to add a little color at the end or to hasten cooking, simply oil the baking sheet or opt for foil for easier cleanup no matter what the temperature rating of the parchment may be. My favorite temperature range for roasting vegetables is 400°F to 450°F. I usually settle on 425°F, and the following time estimates are based on that temperature and bite-size (or roughly 1-inch) pieces. Cooking times will vary slightly based on how large/small the pieces are cut, the color of baking sheet (dark cooks more quickly than light), and the individual oven. *Mushrooms, tomatoes, onions, and bell peppers are veggies I freely mix depending on desired outcome. A shorter roasting time yields a crisper, firmer vegetable while more time in the oven progressively softens and caramelizes. **Again, size/thickness matters. I recently roasted carrots in just 20 minutes by slicing them in 1/2-inch thick pieces. Tip: When done, the tip of a sharp knife should pierce the vegetables easily. If you’ve found roasted vegetables to be mushy in the past, chances are you simply need to reduce the cooking time. I prefer garlic powder to minced fresh garlic when roasting at high heats, as the little bits of fresh garlic tend to burn and become bitter. Similarly, fresh herbs are best sprinkled overtop the veggies once cooked. Less common but quite delicious vegetables for roasting include Jerusalem artichokes (which taste a bit more like a potato or turnip than an artichoke), radishes, celery root (also known as celeriac), turnips and parsnips. Food will brown more quickly when cooked on dark-coated or old, blackened baking sheets and will brown less on light colored baking sheets or when there’s an insulated barrier like a Silpat. The vegetables will brown first on the underside, where they are in direct contact with the heat of the pan. Accordingly, you can increase browning by placing the flat, cut sides down and not turning until the bottoms are nicely golden. Technically, you don’t even need to turn if the bottoms aren’t overbrowned. Aim for color on one side; at most oven temperatures, the vegetables will be cooked through before there’s time to brown multiple sides. If you find the vegetables are cooked to your liking but lack that appealing golden brown color, or if you simply enjoy crispy edges with a hint of char, you can broil them briefly. Just watch closely to avoid burning. 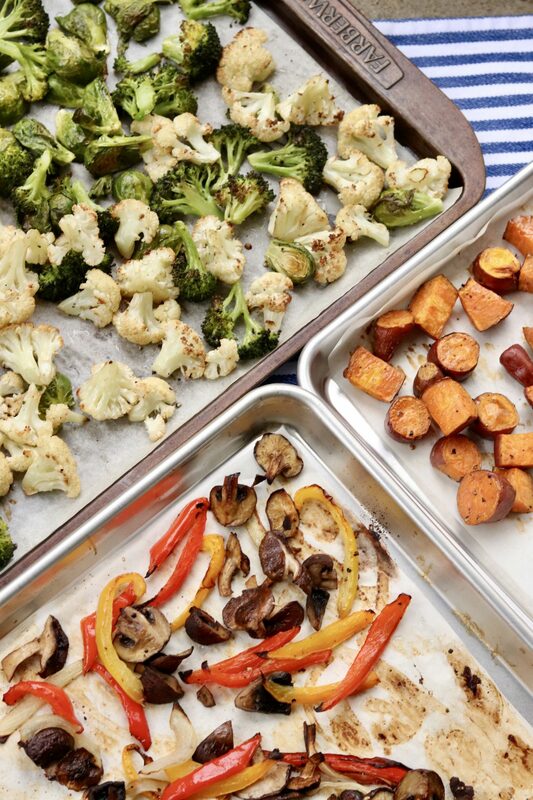 If you want to cook everything on the same baking sheet, you have three choices. Either choose veggies that have similar cooking times, add the vegetables in stages or cut the longer-cooking vegetables in smaller pieces. This convenience may require some trial and error, but a few minutes of extra cooking is unlikely to dramatically change the outcome or most veggies. Just be sure to flip the vegetables if the undersides are sufficiently browned. To promote even cooking and to prevent steaming the vegetables, allow for space between the pieces. If you can’t fit the vegetables in an even layer on one baking sheet, use a second one. When using more than one baking sheet, you may use the convection setting if your oven has one, or simply rotate the pans halfway through the cooking time. When roasting vegetables, I most frequently reach for avocado oil. It has a high smoke point (the temperature at which an oil starts to burn and smoke), is touted for its health appeal and has a mild flavor profile similar to olive oil, one of my other kitchen staples. The smoke point of the commonly used extra virgin olive oil is slightly over 400°F. Virgin and light olive oils are more refined alternatives that carry a higher smoke point. Generally speaking, the more refined an oil is, the higher its smoke point, because refining removes elements that cause the oil to smoke. Refined oils typically have a neutral taste and smell as well as a clear appearance. Butter, for example, has a modest smoke point of 350°F, while ghee, a type of clarified butter from which the water and milk solids have been removed, has a smoke point of over 450°F, making it an excellent option for cooking at high heat. Note: Variations in the listed smoke points will exist based on how refined any particular oil may be. Roasted vegetables are a delightful side dish, but don’t stop there. They lend flavor and heft to a seemingly endless combination of “bowls,” an increasingly popular concept thanks to their healthy, affordable, flexible nature. 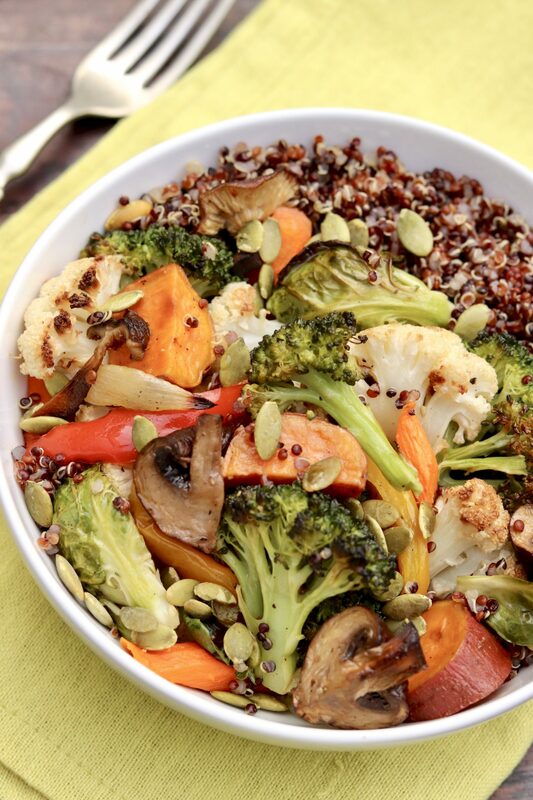 Start by piling roasted vegetables on top of your favorite cooked grain, greens or a mix of both. Chopped, cooked chicken, shrimp, pork and steak are worthy protein choices and offer a great way to stretch a small amount of leftovers among several diners. Similarly, a little bit of bacon or sausage goes a long way, but roasted veggie bowls can be satisfying meatless meals, too. Protein-rich meatless options include eggs, shelled edamame, chickpeas and other beans and legumes , and tofu. Drizzle with your favorite dressing or vinaigrette, or use a dollop of guacamole, hummus or salsa. 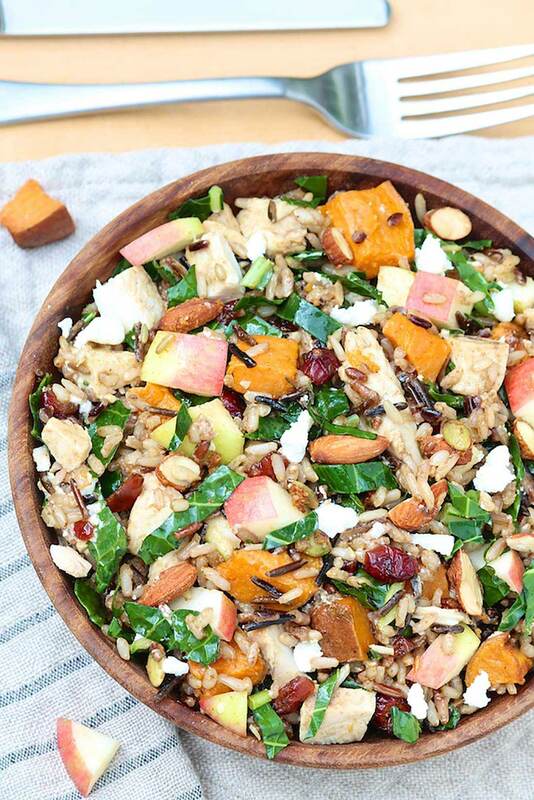 “Finishing touches” of nuts, seeds, dried fruit, avocado and/or cheese provide an extra layer of flavor and texture. Bowl meals can be enjoyed warm, cold or room temperature and, because they travel well, are great for work or school lunches. 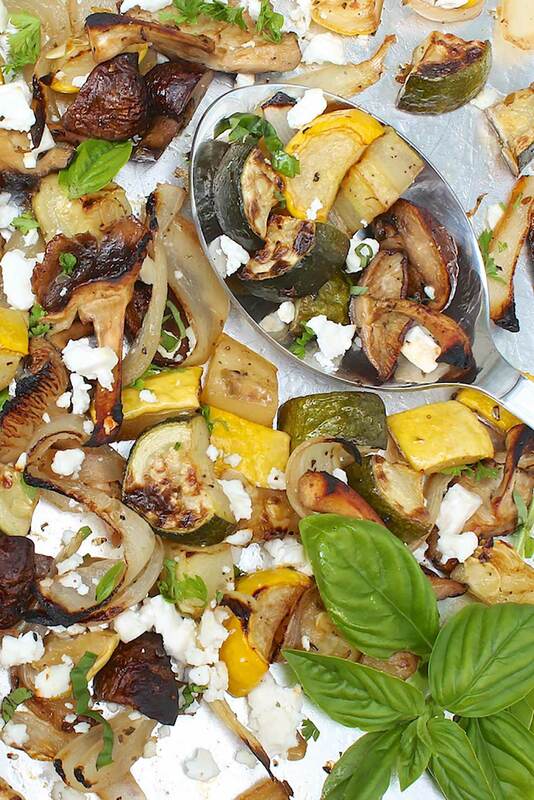 Roasted veggies are easy, versatile and inexpensive, and you can use what you like or have on hand. Keep this handy guide on hand for easy answers to all your questions. Roasted Zucchini and Mushrooms with Feta are delightful as is or served as a filling pasta entree. 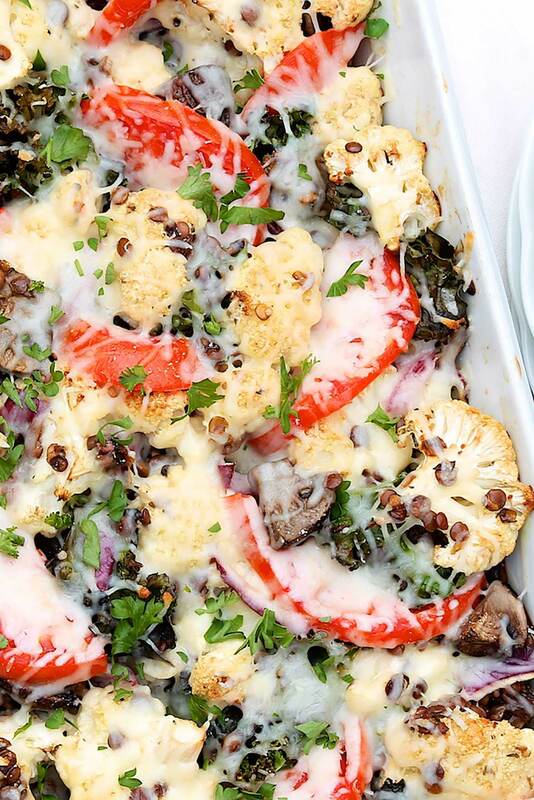 Cheesy Roasted Lentil and Veggie Casserole is a hearty vegetarian meal that will likely satisfy the meat eaters in the crowd. 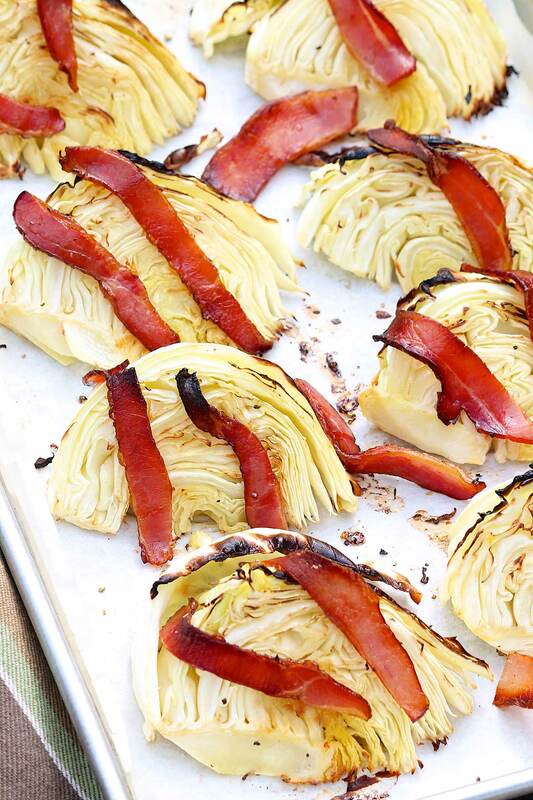 Bacon Roasted Cabbage is unexpectedly delicious and so very easy. 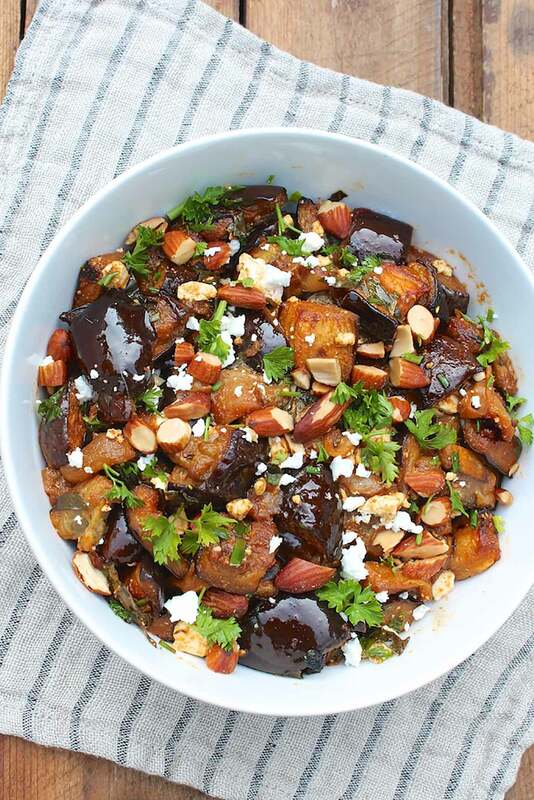 Roasted Eggplant Salad with Smoked Almonds & Goat Cheese isn’t your ordinary veggie salad but is a must for all eggplant fans! 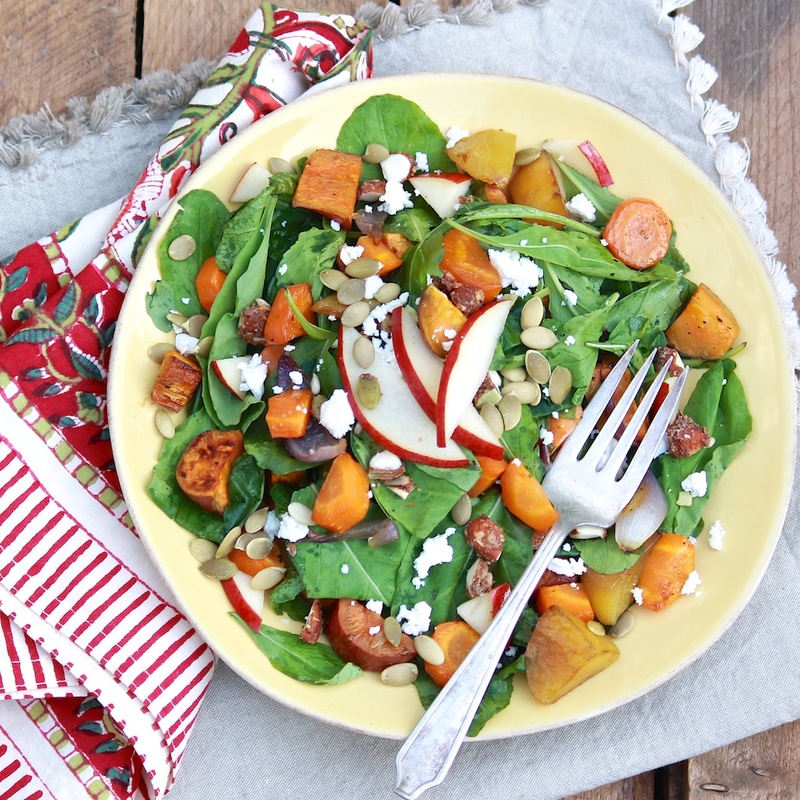 Roasted Root Veggie Salad with Apple Cider Vinaigrette offers a heartier option to the typical green salad with lots of texture and flavor. Harvest Bowls are my version of a Sweetgreen customer favorite…it’s the sort of healthy, all-on-one meal you’ll be happy to dig into! So happy to have this thorough veggie roasting guide and will save for reference. Especially liked the seasoning suggestions and oil primer. I’m so glad you find it helpful, LaVonne. Thanks for your comment! Thank you for such an informative guide. I can’t imagine the amount of time and effort you put into this guide. Thank you, I needed it. Hi Jennifer, You are most welcome and I hope you enjoy lots of delicious roasted veggies from here on out!